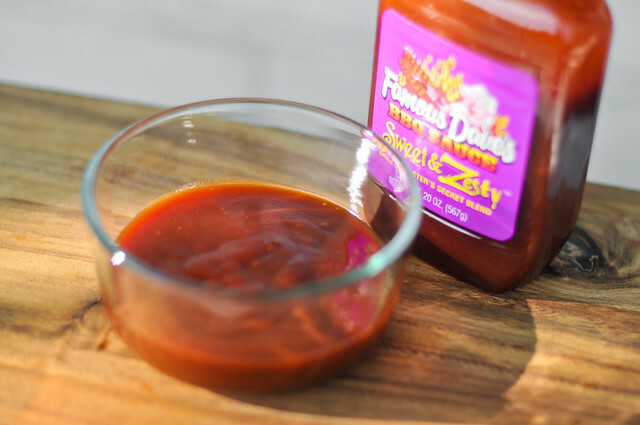 Sticking with the "chemistry experiment" metaphor, this sauce was an odd combination of flavors that did make "Sweet and Zesty" an apt name, but lacked a natural feel, taking it down a notch. 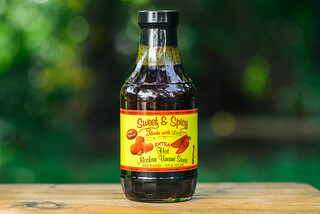 It could be used as a condiment or a grilling baste, but both tasks were performed with mediocrity. 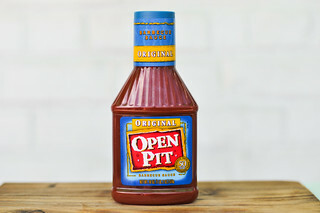 While this sauce is not bad in the grand scheme of things, it's also not something worth seeking out. Each time I go into my local Target, there's a wall of Famous Dave's sauces staring me right in the face. This sprawling barbecue chain/empire is producing 9 different barbecue sauces, and while I wasn't so hot on the first one I tried, I do plan on working my way through them all in time. This is the funkiest smelling sauce I've come across to date. More sweet than tang, there's an earthy sweetness that's a little tomato and a little fruity. Although a malt vinegar aroma is in there, it's very mild on the nose compared to the vinegar in a lot of other sauces I've been sampling. A thick medium sauce, it clings to a spoon, slowly dropping off in globs as gravity takes its toll. Its reddish-brown in color and while doesn't have too many visible spices, there are some pieces of onion breaking apart the smoothness. 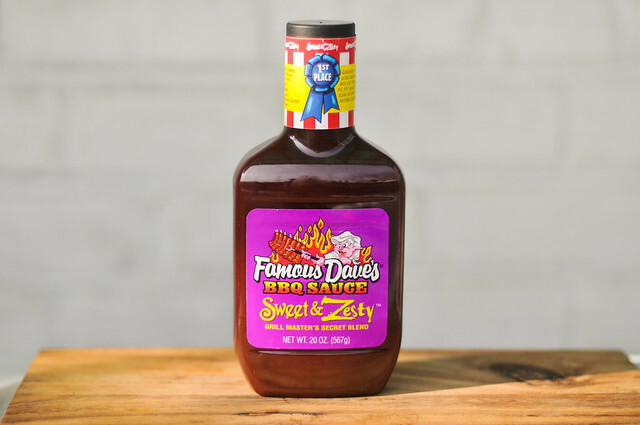 In my last Famous Dave's review, I got a comment that stated "a lot of Famous Dave's sauces taste like a chemistry experiment," and I couldn't agree with it more in terms of this sauce. 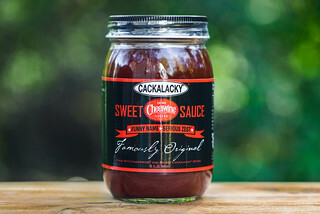 The thick, tongue coating sauce has a complex and odd sweetness that defines the flavor. As it sits in your mouth, a malt vinegar flavor peaks it's head out temporarily, before leaving a sweet and spicy aftertaste. There are chunks of onion that add a crunch, but little else feels very natural about. 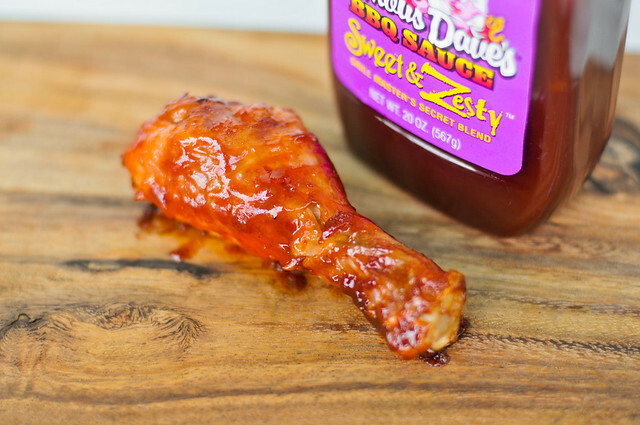 This sauce baked into the chicken without ever really caramelizing. The sticky coating lived up to it's name, with a very similar sweetness and zest when tasted out of the jar. The sweetness was still the dominate player here, with just a little tang and almost no heat. Hey Josh- You've got a nice blog going, glad I saw it on SE today. Keep up the good work! Good in the restaurant and good at home. This stuff is so good. I find excuses just to use it. I think its especially good for someone who likes sweeter tastes, for example Pepsi over Coke, I also like vinaigrette salad dressing as well as the sweet ones thousand island, french. Donuts, waffles, heavy pasta beef etc all. I will be buying more. I get it at Wal-mart and really enjoy it. I also love malt vinegar on fries and Heinz 57 sauce, and mustard. Can't get enough of this one!